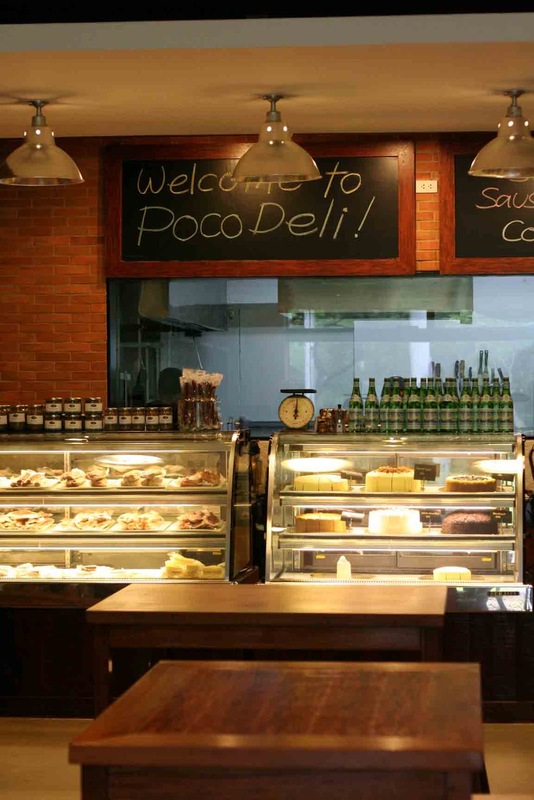 We finally got the chance to try out one of the most raved about food haunts in the Kapitolyo area: Poco Deli. 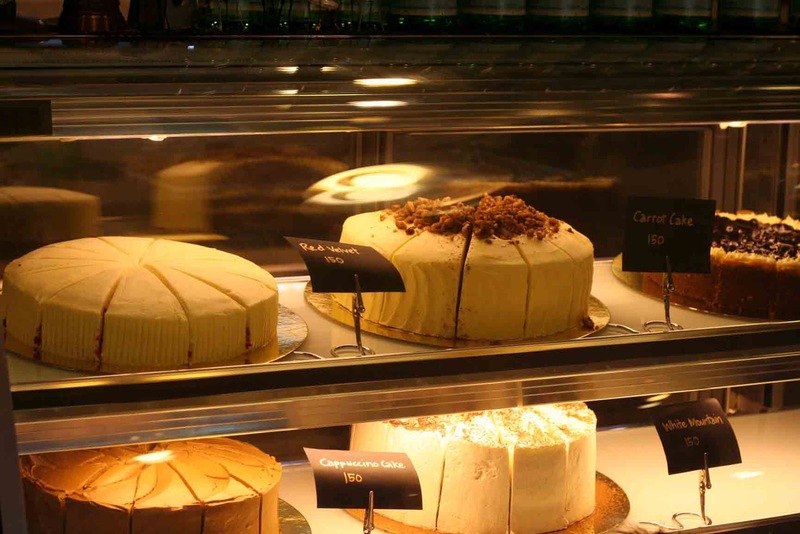 The shop, famous for its comfort food, ambrosial sausages, and luscious cakes recently opened a branch at the Ayala Triangle. 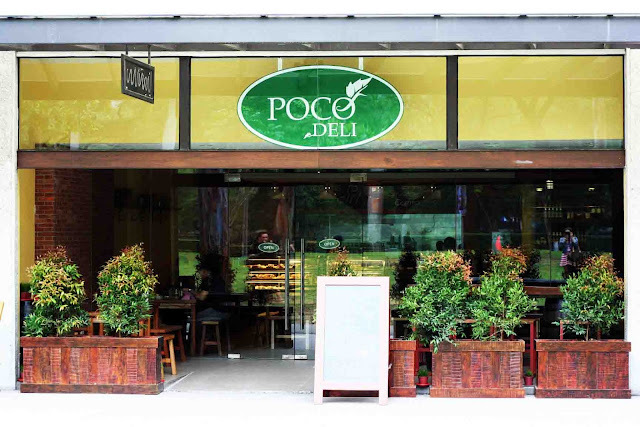 Poco Deli at the Ayala Triangle boasts of a classic delicatessen interior. The roomy place oozes with rustic charm and warmth. Red bricks that lined the wall complimented the wooden tables and chairs. Various vintage trinkets adorn the place. 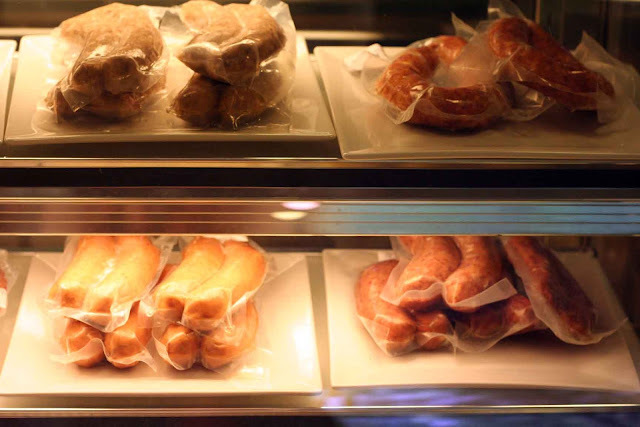 Refrigerated glass display houses different delicious flavors of Poco Deli's artisanal sausages and heavenly cakes. 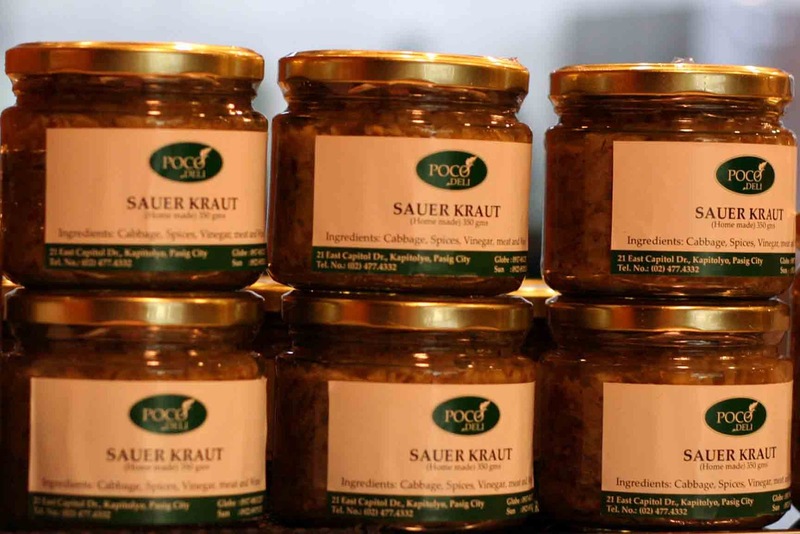 Bottled delicacies such as sauerkraut are also available. Pocoi Deli has a very tempting list of gourmet sausages. After much struggle in choosing, we decided to get the Wagyu and Lamb Sausage Plate. Delicious! Delicious! 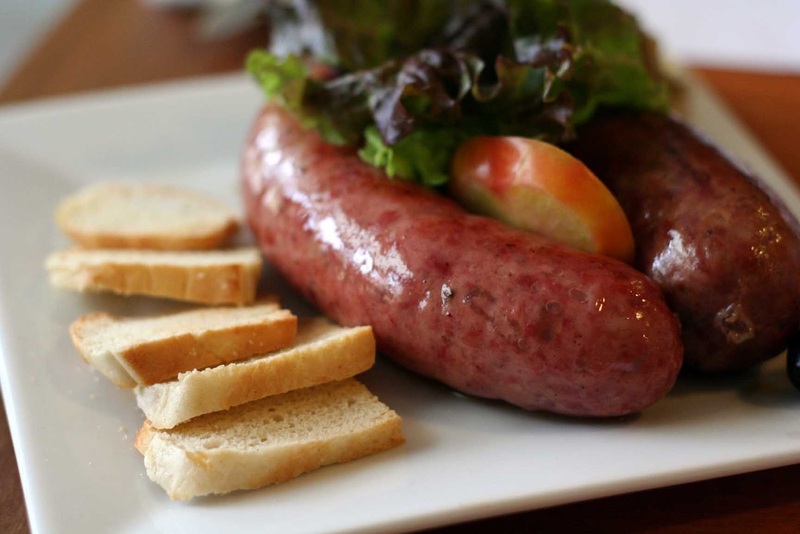 The glistening transparent casing gives way to a tender, juicy meat bursting with fantastic flavors! 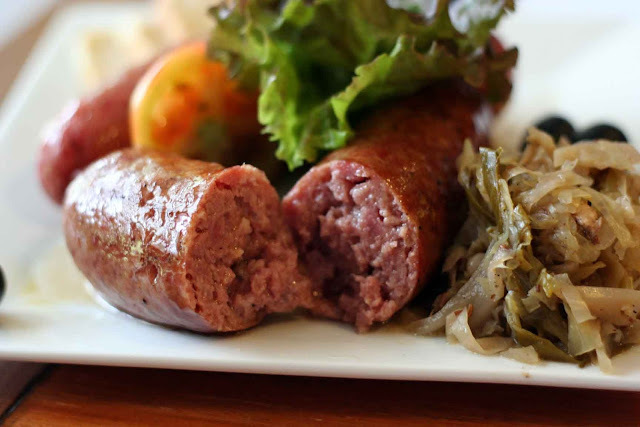 The sausages were complimented with a siding of savory sauerkraut. Any menu that has the word "bacon" in it puts a wide smile on my boys' faces. I love bacon, but not as much as them! They revere the cured meat! Poco Deli's Bacon Slabs is tremendously good! 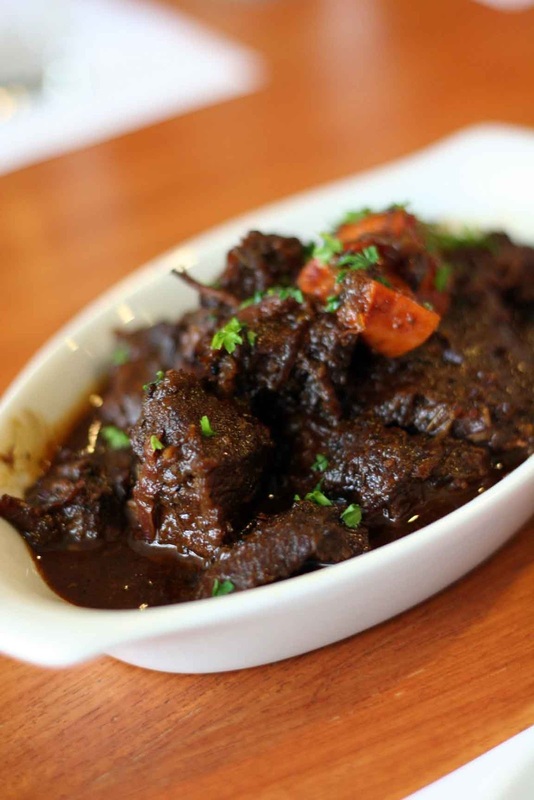 It was so good that you can forego of the fact that a simple glance at the dish might induce a mild heart attack. The delicious salty, rich, and smoky slabs were so juicy and tender! The sunny-side up eggs added an extra dash of intensity to the dish. 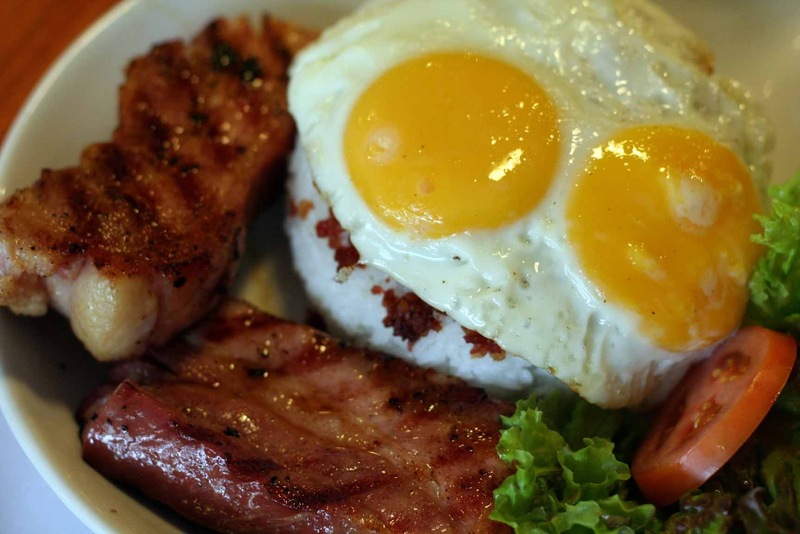 The crunch factor that we bacon maniacs are so accustomed to can be found on top of the rice. 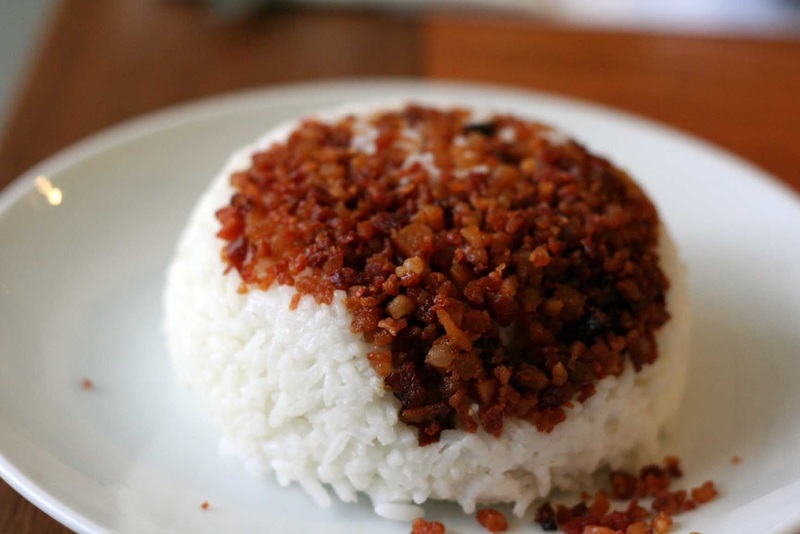 A hefty serving of rice topped with bacon bits accompanies the slabs. 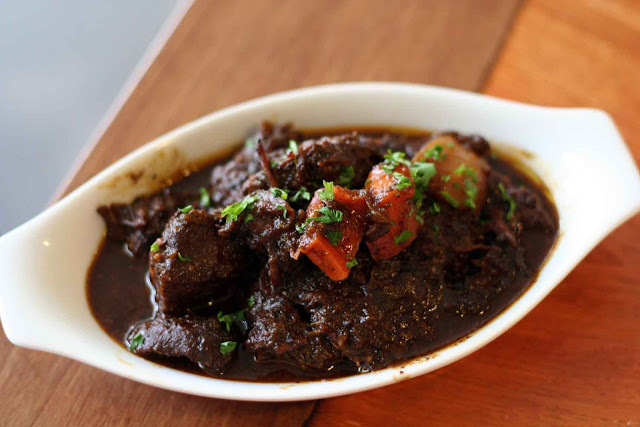 The Irish Beef Stew was cooked perfectly. It was the melt-in-your-mouth tender kind of beef stew; but it lacked depth. It wasn't as flavorful as one would expect. Being a heavy rice eater than I am, I was disappointed with the way the rice was cooked that day. It was too soggy. 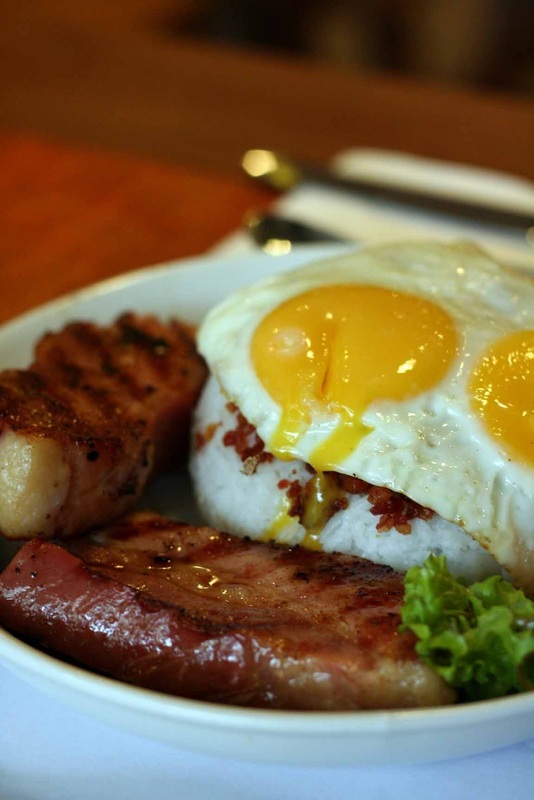 A rice, as simple as it is, has the ability to make or break a dish. I wasn't able to finish mine even if it was half-covered with bacon bits. 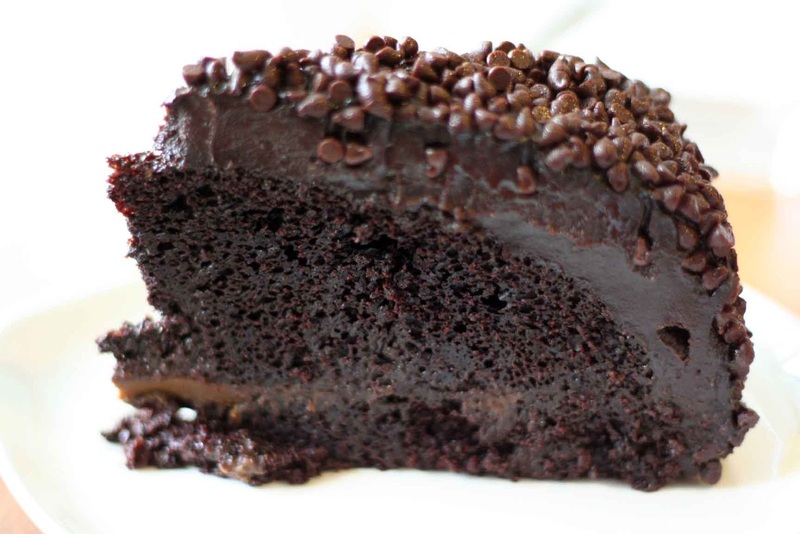 And because Poco Deli's infamous Blackout Chocolate Cake is not meant to be shared, we got a slice each! This is the kind of cake that will bring out the selfishness in you. This cake is simply perfection! 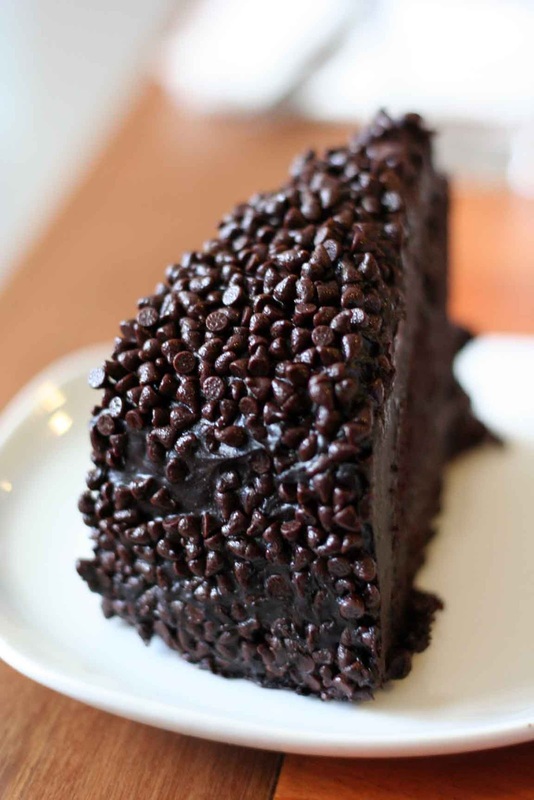 The half-inch thick ganache topped with chocolate chips itself can make you delirious! 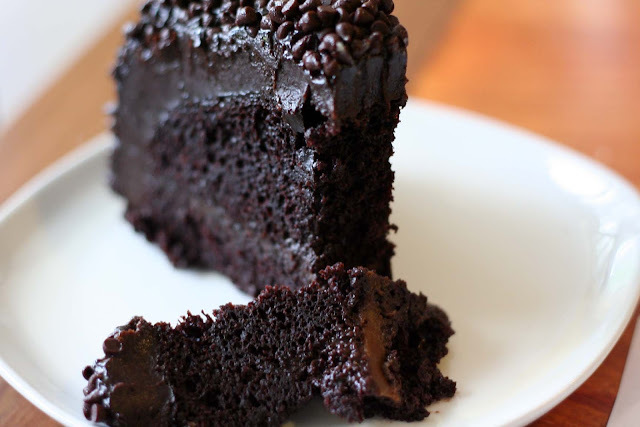 The lusciousness continues in the ultra moist, spongy center and into the caramel filling. Amazing!